Well, oh yes, it could be. 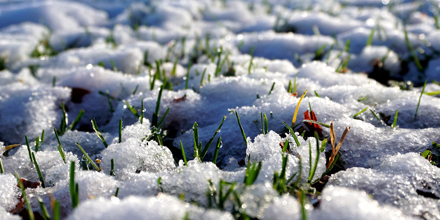 Winter is the perfect time for a villainous and deadly disease to take hold of your lawn throughout winter – especially when you’re not looking behind you! So, if you want your garden to look less pantomime and more Midnight Summer’s Dream come spring, you’ll need to keep your eye out for these felonious fungi throughout the winter months. Don’t walk on the grass when there’s snow! If you suspect your lawn has a diagnosis of Snow Mould, then invest in a hand-held fungicide that will help you tackle the lawn - head on! If you haven’t done this and are seeing signs of Red Thread in your lawn (typically in moist weather – summer, autumn, winter) you can use a fungicide that contains Trifloxystrobin. This is a fungicide that is available for amateur use. However, do not use a Trifloxystrobin solution twice in a year as your lawn will build up an immunity to it. As always, prevention is the best cure, but if you should come up against these potential turf terminators make sure to treat it with a Trifloxystrobin fungicide and put these diseases to bed!